Where should I park for events and games? 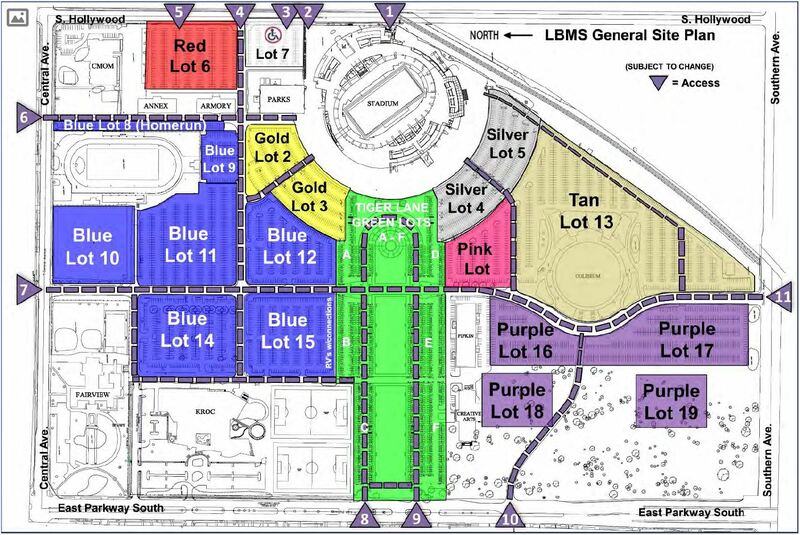 For General Parking, available lots and entry Access Points vary per game and event. For most events on property the General Parking Lots can be located at Access 7 on Central Avenue or Access 11 on Southern Avenue. For specific game day parking info please visit Game Day Info. To view our Parking Map please click here, or visit our Parking Page for more information. The main ADA parking lot is in Lot 7 and can be accessed via Access 4, off South Hollywood. NO Tailgating is allowed in these areas, and they are first come, first served. All guests parking in these areas much have a valid ADA placard or permanent tag that is visible at all times. Patron golf carts, ATV’s and scooters are strictly prohibited on property. Any utility trailer, flat bed, truck, or vehicle entering LBMS property carrying this type of equipment will be denied entry, regardless of credentials. For Bus Parking, the lots available vary per game and event. For most events on property, Bus Parking is restricted to Tan Lot C ONLY located at Access 11 on Southern Avenue. Please visit Game Day Info for specific game day parking information.